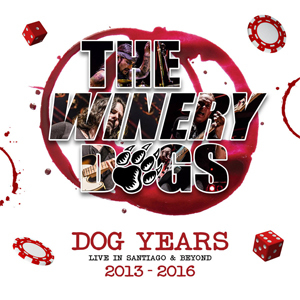 On Record Store Day’s Black Friday, November 24, THE WINERY DOGS--Richie Kotzen (vocals, guitar), Billy Sheehan (bass), Mike Portnoy (drums)—will release a limited edition vinyl of their recently released DOG YEARS: LIVE IN SANTIAGO & BEYOND 2013-2016 exclusively to independent record stores. It consists of three red and white marble colored vinyl albums, featuring the live audio from the concert as well as the DOG YEARS EP. For participating stores, fans can go to Recordstoreday.com. Originally released in both standard and deluxe editions August 4 on Loud & Proud Records, DOG YEARS: LIVE IN SANTIAGO & BEYOND 2013-2016 is a collection of live concert footage, music videos, and an EP of previously unreleased studio tracks. A trailer can be seen below.